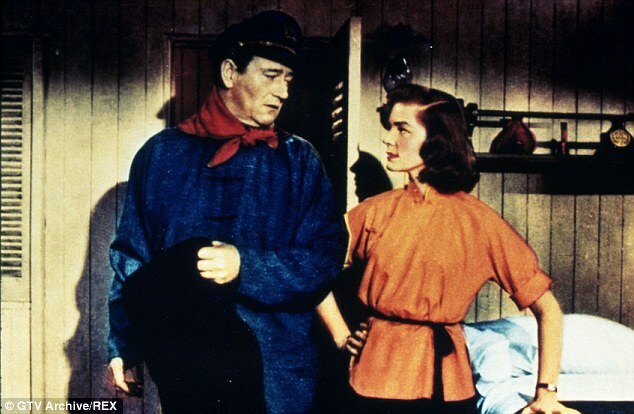 BLOOD ALLEY has Duke opining “I hate the Reds ‘cuz they closed down a lotta ports where I had dames.” This understandable grudge no doubt figures when our hero bayonets a lustful Commie about to ravish co-star Lauren Bacall. Sprung from a Red prison, a mariner-at-large is lured into helping an entire village escape 300 miles downriver to Hong Kong, using a dilapidated paddle steamer. This means dodging the enemy at every turn and contending with sabotage on board. Behind The Conqueror, which occupies a category all to itself, this William Wellman directed slog has John Wayne giving his worst performance of the decade, not helped one bit by terrible writing and a really irritating gimmick which has him looking at the ceiling at intervals throughout and talking to “Baby”, his long-deceased love. Oh, the pain you will indeed feel. Roy Webb’s score attempts a Tiomkin-like flamboyance but succeeds only in matching decibel levels. 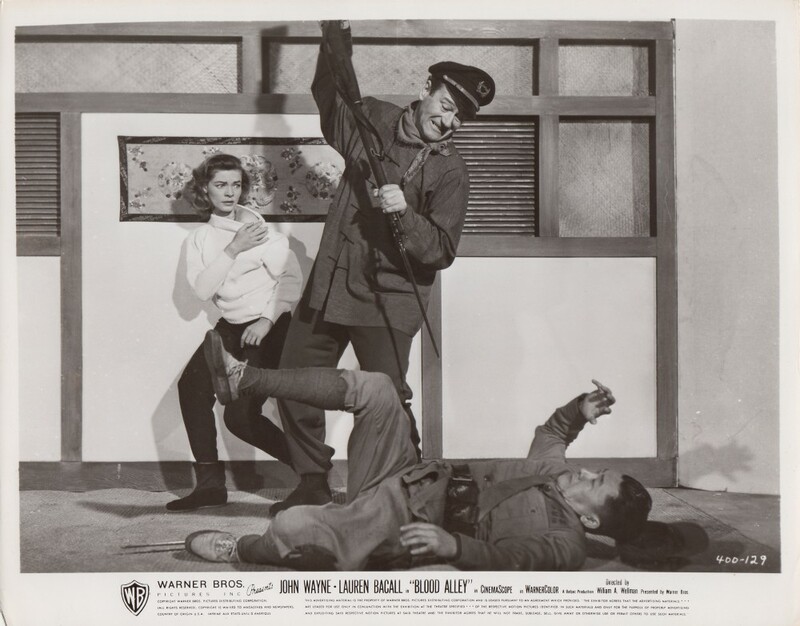 The $2,200,000 production came in #38 for the year, yet still posted a loss, despite a cast of ‘Chinese’ including most-venerable Paul Fix, most-honorable Mike Mazurki and most-ample Anita Ekberg. Quoting Bacall: “That was supposed to be Mitchum, but he got into some brouhaha–probably had a few too many….not a good movie, but I liked working with Duke. We didn’t agree politically, but we got along well and had a sort of chemistry.” Mitchum’s brouhaha involved him shoving the film’s production manager into San Francisco Bay, so Wayne (producing) took over for these 110 turgid minutes, ralphed from the autumn of 1955.